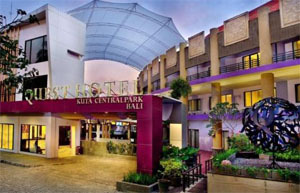 As its name implies, Kuta Central Park is a city hotel located in the near the strategic area of Kuta Central Park. From Ngurah Rai International Airport, this hotel is about 7 kilometers and could be reach in 15-20 minute driving. Kuta Central Park is close to Kuta Galeria Shopping Arcade, Kuta Beach, and Legian Beach. Also nearby are Bali Blast Monument and Mall Bali Galeria. There are 226 guestrooms in this hotel which are set up in a 3 floors building. All guestrooms at Kuta Central Park provides comfortable facilities like high definition television with satellite or cable TV, coffee/tea maker, refrigerator, complimentary Wi-Fi internet access, safes, and non smoking rooms. Bathrooms offer shower/tub combinations, bathrobes, and hair dryers. Kuta Central Park offers a spa service, an outdoor pool, and a children’s pool. Besides in room. complimentary wireless Internet access is also available in public areas. A spacious parking lot and 24 hour security service with CCTV are provided for your comfort and safety. There is also a business facilities including a business center, a conference room, and audio-visual equipment. Dining options at this hotel include a restaurant and a bar/lounge. The staff can provide concierge services, tour/ticket assistance, and currency exchange. A roundtrip airport shuttle is available upon request. Whatever your purpose of visit, Kuta Central Park Hotel is an excellent choice for your stay in Bali. Stayed at this hotel for 7 nights and was really impressed! when we first got there our rooms weren’t quite ready, so they happily upgraded us to a bigger room and two king beds instead of two single beds. The staff were amazing and so friendly (especially the bar staff) good location, more closer to legian than anything. would defiantly stay there again. aircon worked fine.. We just left a key in the key holder whenever we left to keep the electricity on and took another key to get into our rooms. Food was pretty good as well! First time to Bali and stayed for 3 nights. This hotel exceeded our expectations, probably because it was newly built, the whole place has a vibrant feel. The room was very spacious and comfortable, with all amenities you’ll need, and 2 air conditioners in the room functioned well. The pool is rather small but you can’t fault it for its price. The breakfast was great, (really doubt previous reviews complaining about the lack of variety for the price paid) there’s a mixture of local indonesian food and western (pancakes, waffles, crepes made on the spot, omelettes/poached eggs made upon order). Location wise, it’s right smack in Kuta. A 10 min taxi ride (less than $2usd) will get you to where the clubs are. The hotel provides a free shuttle bus service to Legian beach and to Discovery Mall if you book in advance. The shuttle service is reliable and punctual. There are eating places and convenience stores just across the hotel. We had booked a room with balcony via Balihotelguide.com, once we arrived and wanted to check-in the rooms with balcony were not available any more. Luckily the nice lady at the reception named Rika, was trying to find a solution immediately. Her offer was that we could stay one day in a room without a balcony and to check the next morning if we wanted to have a room with terrace or balcony. We chose the balcony and somebody helped us very good to move our luggage the next morning. Breakfast is typical Asian and for Europeans there was not a lot. But that was totally not a major issue for us. The location for two people is good if you rent a motorbike like we did. The beach is 5 minutes drive, legian street is less then 3 minutes and the shopping malls are around 10 minutes drive. A supermarket is around the corner. We had a very pleasant stay. My compliments. Thank you for your stay with us. We are sorry to hear that you did not get the room as per your booking upon arrival. We appreciate your cooperation that you were moved one day after. We will take a look about the breakfast menu as you mentioned. By the way thanks for your good comment about our property. though quite far from the beach (20 mins if you don’t get lost) and in an unfortunate surroundings of an industrial zone. The staff are very helpful and the food is delicious. Rooms are spacious, although the view is not very impressive (as stated in the description of the superior room at their web page). Also, check the prices at the hotel’s lounge bar *before* ordering something. It can be quite expensive. Room Tip: If you like your peace and quiet, make sure you don’t take the room overlooking the pool. Thank you for taking your time to review our Hotel. We are more than happy to receive your positive comment about our property. We just want to share with you that our new Spa Room with Sauna and Jacuzzi and Gyms will be ready by the latest end of October. We hope these new additional facilities will make your next trip more memorable.